The dining room or area has a special place in Vaastu shastra. The room should contain a table large enough for family and guests to entertain with food. Keep in mind that the dining area is directly related to the health, harmony as well as the prosperity of the family. A good dining room, which has been made using vaastu principles, often brings strength to all members of the family. A dining room that is in harmony will naturally strengthen human relationships among friends and family. Regardless of whether you take your meal at the dining table regularly or not, there are some simple vaastu suggestions about the dining room that you, l want to observe. The shape supports the energy flow, so the dining table should ideally be in a square or rectangular shape. As per vaastu, square or rectangular shape represents the stability. People at the dining table should never face south while taking a meal. The master of the house should occupy the most important chair which is at south-west side facing north or east. Use of colors like green, orange as well as yellow is highly recommended in the dining area. Avoid using any shade of grey or brown in the dining area. Any painting placed near the dining area should be cheerful and attractive. Place images of fruits, vegetables, greenery or something which stimulate your appetite. The display of sad art has no place in the dining area. Dining with your family should be a fun and happy experience. 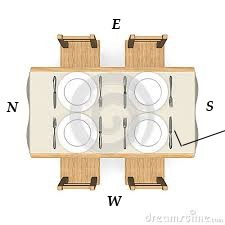 According to ancient books on vaastu, it is recommended to place dining table towards the west part of the house. Avoid placing a dining table below the beam. Overhead beam carries the burden of the whole building structure, which causes pressing down the luck. A dining room should be free of distraction including televisions, clutter, and large amounts of table top deccor. Place wash basin in the North or East side of the dining area. Avoid having the dining room seen from the front door. This can cause a loss of wealth. Using mirror in the dining room is beneficial. It also stimulates energy flow, which in turn stimulates conversation. Place posters or photos of mouth-watering dishes in the dining area to arouse hunger.